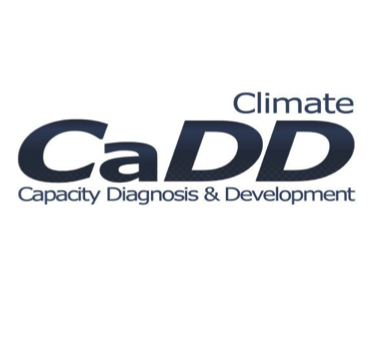 The Climate Capacity Diagnosis & Development (CaDD) tool provides organisations (and the systems of organisations they form part of) with approaches for measuring and improving their ability to manage climate change risks and opportunities (including climate impacts and carbon management). This guidance takes the form of a tailored action plan to develop the organisation's capacity that builds upon what they already do well. CaDD can be used for many purposes (see below), ranging from reviews of single organisations to multiple organisations that form a system of organisations. Those organisations who complete an online CaDD inquiry receive a tailored roadmap showing how they can move directly from assessing the status of their climate change programme to planning improvements in it. The CaDD tool acheives this through identifying internal, external and systemic strengths and weaknesses - enabling the most efficient design, delivery, and monitoring of meaningful interventions. Many organisations are using CaDD to better understand how to work internally and externally with stakeholders. This includes: development organisations, large engineering firms, local authorities, policymakers, sector and industry groups, civil society organisations, researchers, inclusive business approaches, private sector development, and a multitude of other SMEs, public sector bodies and large corporations. The CaDD framework contains metrics that provide insight into the different capacities organisations possess that are required to address the types of climate change challenges that are relevant to them. It also identifies the most effective next steps (and beyond) that are required to improve that capacity if a capacity gap exists. The framework is formed of a 6 by 9 matrix. The vertical axis of the matrix has 6 predictable levels of response that an organisation can have when faced with climate change challenges (either adaptation or mitigation)(see figure below; the top of the pyramid is RL 6 -the champion organisation). Knowing which of these response levels an organisation is at, helps us understand how best to work with that organisation to improve responses. This aspect forms the backbone of the CaDD Pathfinder that reviews multiple organisations at once. It does so by rapidly determining which response level a given organisation is at. The response levels have been developed, tested and evidenced with thousands of organisations spanning more than a decade. Building Capacity: Capacity increases in predictable ways at each Response Level (RL). Each Response Level can only become robust if it is built upon the solid foundation of the Response Level below it. Not all organisations need to be able to operate at higher levels and those at different levels need very different types of support. The top of the pyramid represents RL 6 - the champion organisation. Awareness: Not just that climate change is happening, but what it means to the organisation and its operations, policies, communications, etc. Agency: The capacity to spot, prioritise and develop opportunities for meaningful and timely action in response to information about climate change. Leadership: The extent to which a formal leadership team can identify a vision in relation to climate change and can engage with, support and legitimise its implementation. Agents of Change: The capacity to identify, develop, empower and support a group or “ecosystem” of champions at different levels so that they can be effective agents of change. Working Together: More than stakeholder engagement. The capacity to involve, respects the needs of, communicate with, learn from, and act in collaborative partnerships. Learning: The extent to which the organisation can learn from experience and use what it learns to improve procedures, strategies and mission. Managing Operations: The embedding of procedures to get to grips with climate change in a systematic way. Scope & Coherence: How far projects sit within an overall programme for action that is suited to the scope of what the organisation is trying to achieve and updated in the light of what is learned. Expertise & Evidence: The capacity to recognise, access and deploy the necessary skills, understanding and technical and change expertise to make the biggest difference. A rapid, highly-scalable and web-based review of the capacity to include climate change in the decision-making processes of multiple stakeholders in a system (e.g. a supply chain, a government ministry, a value chain, a geographical area, an industry, a sector, and so on) – It is capable of handling from dozens to thousands of stakeholder organisations. It can also grow organically to include new relevant stakeholder as participants identify who else is important to their decisions. In some few cases, it is more appropriate to conduct CaDD Pathfinder reviews in dialogue rather than web-based - e.g. - where access to the internet has been limited (this alternative approach of course has some resource implications). Pathfinder reviews (electronic and dialogue) can easily be updated with your own relevant questions to design bespoke applications for any given project or programme of action. An in-depth comprehensive web-based review and diagnostic of the organisational capacity to respond to climate change issues at an individual organisation level (e.g. a business; a strategic business unit of a company, a local authority, a project, a government department, and so on) – Although we have the capacity to conduct any number of these, the maximum we have so far done in a single project has been 21 (when we reviewed 21 European cities in the ASEC Project ). We would love to find a project where we could do more. These two approaches can be combined so as projects and organisations can understand both the systemic challenges affecting them, as well as diagnosing the organisation’s best next steps to address these challenges. Building interventions upon a foundation of what is already going well. The Pathfinder reviews can also be used to pinpoint where a deeper dive will prove most useful in designing interventions. Both CaDD approaches can be, and often are, supported by dialogue: from individual interviews with key actors, to participatory workshops with multiple actors. We highly recommend that the CaDD Deep Dive is accompanied by dialogue with a CaDD Accredited Expert, or we can alternatively help organisations recruit the right kind of skills appropriate for delivering the results. The CaDD tool was developed by Climate Sense and Trioss, and is a sucessor of the PACT tool, developed by Alexander Ballard Limited, which is no longer trading. The approaches developed by CaDD have multiple uses and we would be delighted to talk to you about these and how they might fit with your specific project or other needs. All our approaches are robust, tried & tested, highly scalable, and great value for money.